Interior design and web design have a lot in common, for both you need to have great taste, organization, and creativity in order to craft an original and beautiful end result. This is the reason almost all interior design WordPress themes look stunning and pristine but we have selected here only the best of the best. In order to choose the best interior design WordPress themes we had to consider a few key elements such as gorgeous and engaging portfolios, lots of customizing options, an intuitive panel, flexibility, responsive design, and eye-catching visuals. Choosing each one of the themes presented below will enhance your website and make it standout more. The name of this theme says it all. Interior Design is a WordPress theme that focuses on interior design companies and does exactly what it advertises. It would not be a great interior design theme if it did not provide various ways of highlighting your work and portfolio this is why it comes with multiple portfolio and gallery styles. Apart from those, it also comes with blog templates, personal profile, WPML compatibility, shortcodes, page options, and more. Create a website that stands out with Interior Design! 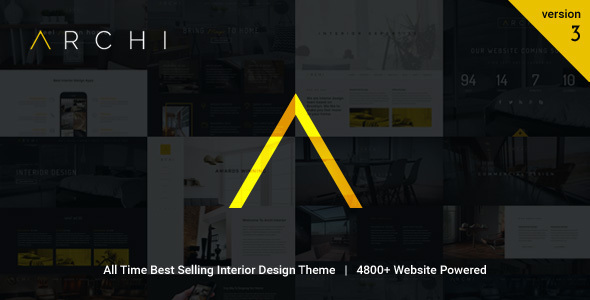 Archi is one of the most popular interior design WordPress themes currently available. There are no limits as to what you can achieve with Archi thanks to its integrated page builder and slider plugins. You can also create your own shop page, change the color scheme, style the menu, choose one of the 8 pre-design homepages, create landing pages and coming soon pages, and add a parallax background. Because of these features, Archi is a solid choice! An interior design company needs to be able to communicate authenticity and professionalism through their website and work and H&D does that perfectly. H&D is a theme that will inspire your audience and guide it in the right direction. 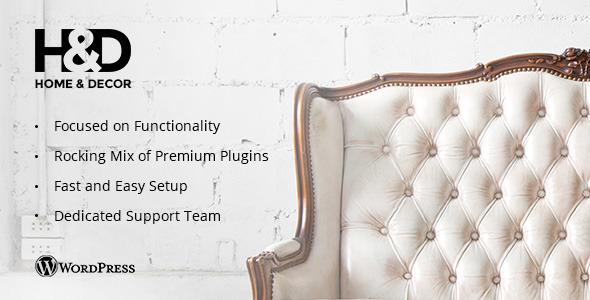 This premium theme has features for days some which are multiple pre-built demos, portfolio page demos, one click demo installer, Essential Grid, Visual Composer, premium slider, responsive layout, easy typography controls, advanced menu, and other powerful options. H&D is a theme worth taking into consideration! 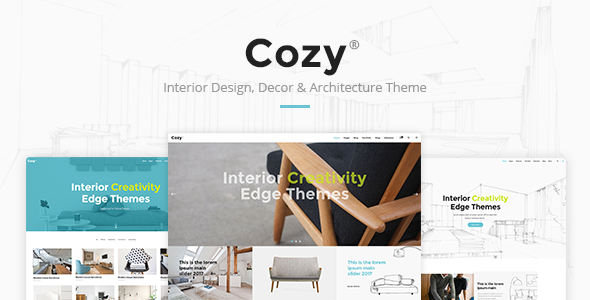 Cozy is a simple, clean, and powerful WordPress theme created for interior designers. Cozy was designed to offer interior designed a platform on which they can present their work and company. This theme features 12 unique homepages and a responsive layout that will look amazing on all devices. The header’s layout is fully flexible and customizable. 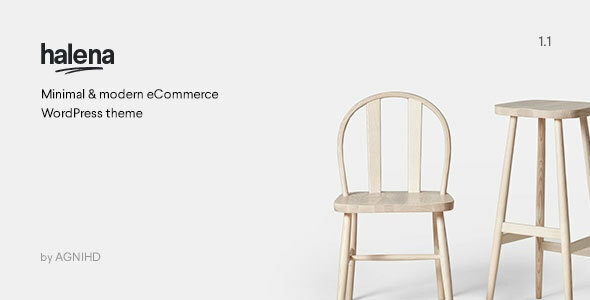 For those looking to sell their products online, Cozy also is integrated with WooCommerce. Cozy is a breath of fresh air among interior design WordPress themes! If you are searching for interior design WordPress themes then you need to check out this theme. Addison offers a stunning design built to represent top-notch interior design companies. Even if it comes with a bunch of amazing features this does not mean that Addison is extremely elaborate and hard to customize. You can play with various portfolio views, galleries, portfolio layouts, typography and colors, custom icons, and other design elements available with the Bold Builder. If you want your website to look like the demo, you can choose that option as well by importing the demo content available. This is the ideal interior design theme for you! 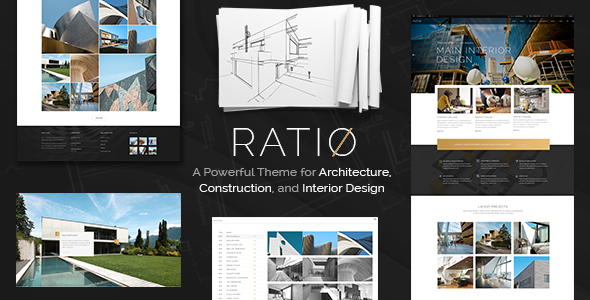 Ratio was developed by a brave theme of developers who took some risks but in the end paid off. This theme attempts to be one of the best interior design WordPress themes on the market and almost succeeds. There are several impressive features included with Ratio such as 15 homepages, 25 portfolio styles, custom shortcodes, multiple project types, 9 shop layouts, 5 blog styles, and 6 menu styles. You can create other layouts using the integrated Visual Composer without any coding. If you are intrigued and want to find out more check out its live preview below! Halena takes the clean and minimal approach for its look and layout. You can popularize it with large images and little text so you do not overwhelm the users and showcase your designs. To get you started, Halena comes with lots pre-designed layouts and demos, but if you want to unleash your creativity you can also use the integrated Visual Composer drag and drop page builder to create new ones. Displaying your work with Halena is a piece of cake and you can customize the typography, layout, colors, and much more. If you want a responsive and retina ready interior design WordPress theme choose Halena! Robin is the kind of theme that will give your website a unique and modern look without spending hundreds of dollars on designers. While there are many interior design WordPress themes that promise this, there is none other as stylish and classy as Robin. 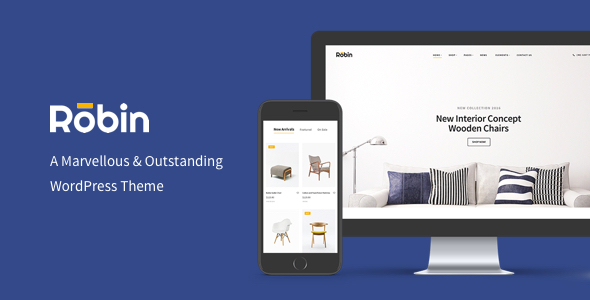 Robin is full of incredible features such as over 9 homepages demo layouts, shop page, interactive sliders, Instagram shop, product navigation, more than 3 portfolio designs, various header and footer styles, and amazing parallax effects. Fall in love with Robin! As with any websites, a great theme will make a huge difference for your business. In order to attract customers, Ambient’s design is intuitive, welcoming, and pristine. Ambient features 12 beautiful homepages, stylish portfolio layouts, niche related demo content, pre-built inner pages, lots of typography options, various templates, a complete user manual, online shop, and social media ready. Apart from these options, Ambient is also fully responsive, retina ready, and translation ready. All in all, Ambient is a sophisticated interior design WordPress theme that deserves your attention! 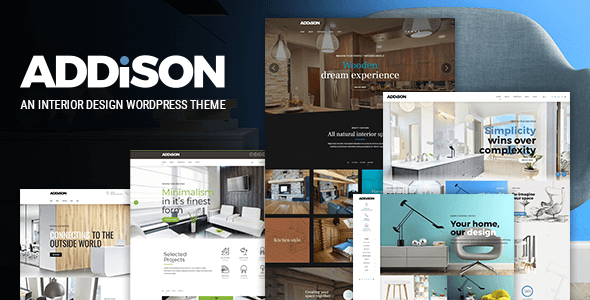 Megatron is not a theme exclusively developed for interior design websites, but a multipurpose one that will take any website to a whole new level. 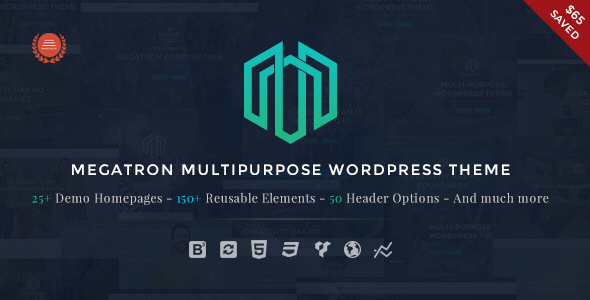 Megatron comes with 25 demo homepages, over 150 reusable design elements, mega menu integration, wide and boxed layouts, 1000 icons and free Google fonts, and three premium plugins included. With the bundled Visual Composer and Slider Revolution you can create original page layouts with only a few clicks. This theme has all the tools you need to build the website of your dreams. Every interior design firm needs to let its portfolio speak for itself, and Innova will help you with that. Innova keeps the focus on your portfolio and work so that your audience can see what you can do. Innova has multiple demo homepages to choose from, SiteOrigin page builder, WooCommerce integration, custom widgets, posts slider, header slider, unlimited portfolios, video support, and more. If you are willing to be creative you can play around with the bundled SiteOrigin plugin. 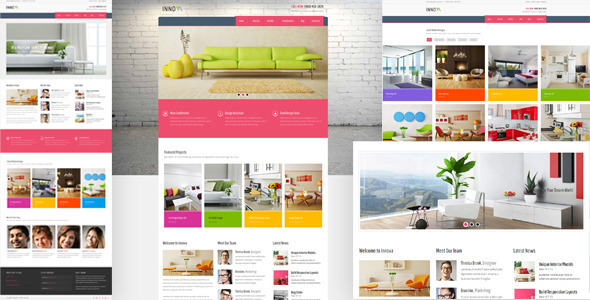 Innova is a great interior design WordPress theme! What better way to get started on your interior design website than with a premium theme like Modern Interiors? This theme is very easy to set up especially due to its integrated one click demo importer. Once you have the demo content you can personalize the theme using GT3 page builder, available fonts, color options, page layouts, custom backgrounds, custom widgets, and custom shortcodes. Showcase your latest designs with Modern Interiors! If you want to highlight your interior design portfolio you can choose Interiart. 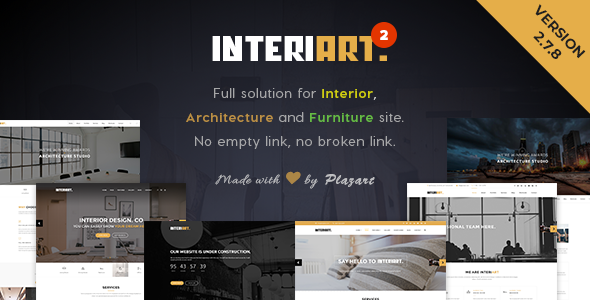 Interiart combines a professional design and superb features that will make your website look appealing to your audience and get you some new customers. This theme includes several premium plugins that you can use to build outstanding layouts and designs. Furthermore, you can customize it using different header styles, footer layouts, unlimited colors, and typography options. If these features are attractive to you then Interiart is the theme for you! 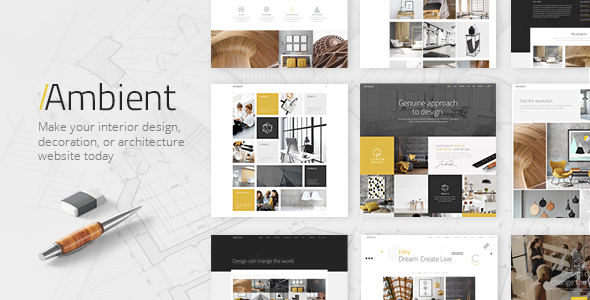 Maison is a gorgeous looking theme suitable for displaying portfolios. This theme was clearly designed for interior designers and architects. 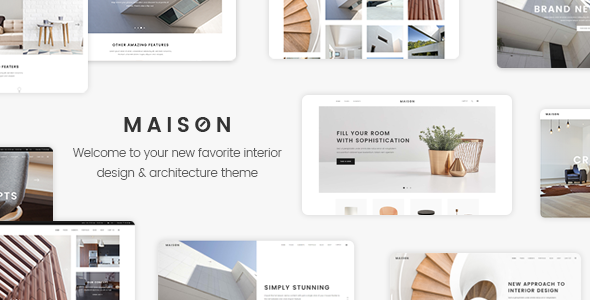 Maison is fully equipped with 12 captivating homepage demos, blog layouts, portfolio styles, shop page, single product page, menu layouts, 800 Google fonts, and a powerful theme options panel. Using these options along with the integrated Visual Composer you will build a personalized layout for your company. The demo content comes included with Maison and it is compatible with all screen resolutions and device sizes. 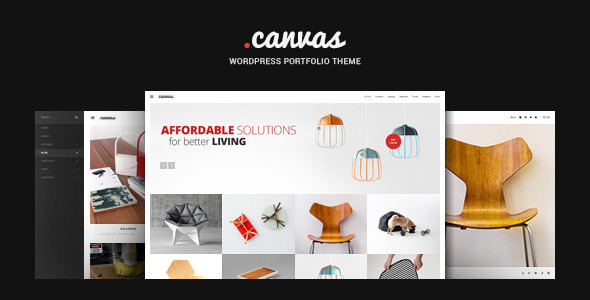 Canvas is a clean and beautiful interior design WordPress theme built to improve portfolios and engage website visitors. The admin panel is intuitive and offers features like interactive sliders, gallery albums, masonry portfolio, WooCommerce online shop, side menu, top menu, color management, FontAwesome icons, 650 Google fonts, custom page templates, and a page builder. Don’t forget to check this one out! 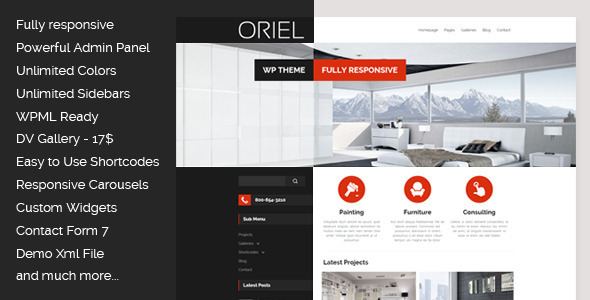 Oriel is an original and eye-catching premium interior design WordPress theme made specifically for this niche. Oriel’s design is incredible and uses all the right elements to showcase interior designs. It includes unlimited color combos, potent panel, lots of sidebars and widgets, compatibility with major plugins, unlimited sliders, Flickr feed, beautiful animations and hover effects, and responsive carousels. All these options combined make for a lovely theme that everyone in this industry should try! DeKor is a vibrant, chic, and flexible WordPress theme designed to meet the needs of interior designers all around the globe. 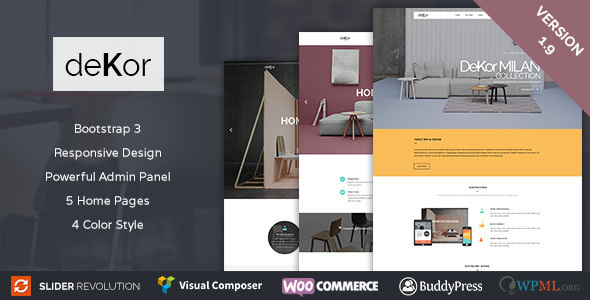 DeKor comes with a powerful admin panel that contains 5 homepages, responsive sliders, page builder, WooCommerce shop, bbPress, built-in mega menu, Google fonts and icons, 5 color schemes, and shortcodes. DeKor is very intuitive and highly customizable without needing to code. This theme is also SEO optimized and will help you reach a higher position in search engines. Use DeKor – one of the best interior design WordPress themes! Geometry makes it easy to display your portfolio with interior designs to your audience. 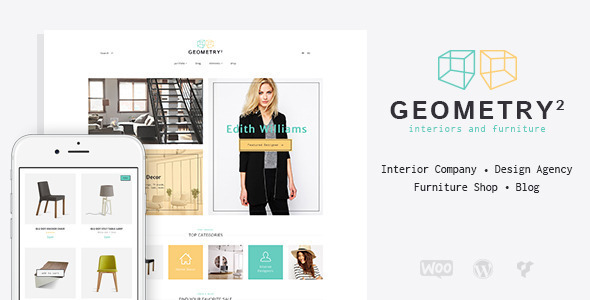 Geometry is a highly customizable and responsive theme that is loaded with impressive features such as 4 pre-made demos, clickable banners, page navigation, special offers, animated presentations, team and feedback sections, 2 powerful sliders, various widgets, and 2 blog styles. Thanks to Visual Composer there are no limits to the layouts you can create so try it out! 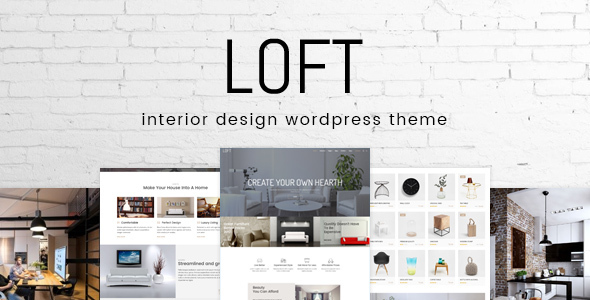 Loft is an incredible, lovely, clean, simple, and effective theme that should be used for interior design websites, but is flexible enough to fit other industries as well. Loft’s design is 100% responsive and tested on all popular browsers for compatibility. All colors of the theme can be changes as well as the typography options. You can easily change the look of your website by choosing of one the pre-made demos. The portfolio is gorgeous and interactive so that it will attract new customers. Without question one the most popular interior design WordPress themes! 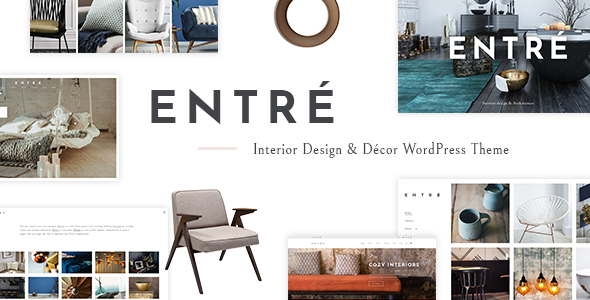 All interior design WordPress themes claim that they have all the options and features an interior designer needs and while some do not keep their word, Entré does. This impeccable theme comes with all the aids it promises. 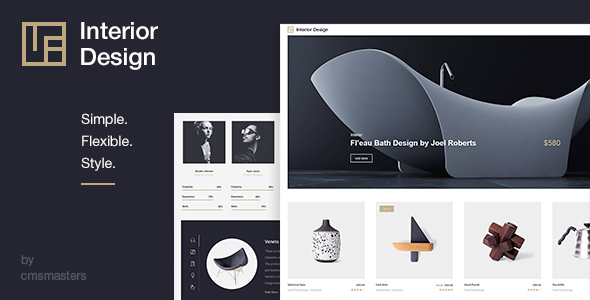 Entré comes with various portfolio showcases and homepages, intuitive admin interface, one click demo importer, Slider Revolution, portfolio slider, custom shortcodes, galleries, inner page templates, and so on. This theme can be the one you’ve been looking for – check it out! Now that we have selected here the best 20 interior design WordPress themes we know you will stop struggling to find the best one. Go through all of them and see which one fits your business the most.